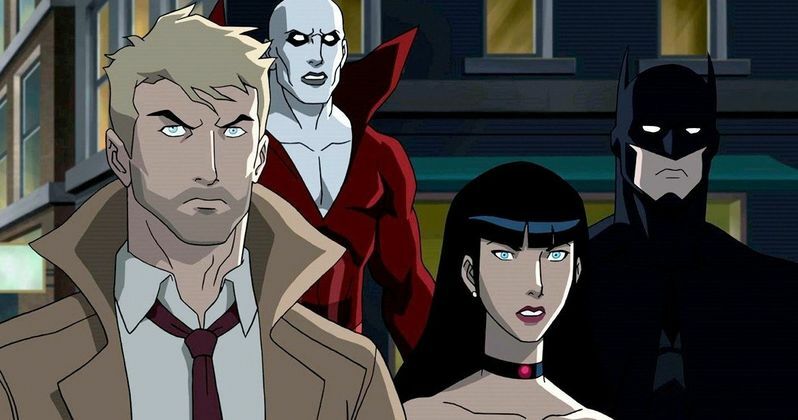 Back in July, a new sneak preview from the Batman: Return of the Caped Crusaders Blu-ray release confirmed that the next DC Universe Animated Original Movie will be Justice League Dark. It was also confirmed that Matt Ryan, who played John Constantine on NBC's canceled Constantine series, and guest-starred as the iconic character on Arrow, will return to voice John Constantine in this movie. Today we have the first trailer for Justice Leauge Dark, along with confirmation on even more cast members. IGN debuted the first trailer earlier today, and confirmed that this movie will be R-rated. This animated adventure will be following in the footsteps of Batman: The Killing Joke. The movie will be rated R for "some disturbing violence," and while we learned about some of the voice cast members in July, even more cast members have now been confirmed. Our report from July revealed that Jason O'Mara is set to voice Batman, with Camilla Luddington as Zatanna, Nicholas Turturro voices Boston Brand/Deadman and Ray Chase voices Etrigan, Jerry O'Connell voices Superman and Rosario Dawson portrays Wonder Woman. This report reveals that Jeremy Davies will provide the voice of Ritchie, while Enrico Colatoni plays Felix Faust, Alfred Molina voices Destiny and Roger R. Cross will be pulling double-duty, voicing both Swamp Thing and John Stewart. DC Entertainment's Mike Carlin revealed in the preview this summer that Black Orchid will also be featured in this story, but it hasn't been revealed who is voicing that character yet. This animated movie is directed by Jay Oliva (Batman: The Dark Knight Returns) from a script by Ernie Altbacker (Green Lantern: The Animated Series), based on a story he created with J.M. DeMatteis. James Tucker (Batman Bad Blood, Batman: Return of the Caped Crusaders) is Supervising Producer. Benjamin Melniker and Michael Uslan serve as Executive Producers, along with Sam Register. Justice League Dark is scheduled to debut on Blu-ray and DVD in early 2017, but a specific release date wasn't given quite yet. It was also announced at Comic-Con that the next two animated movies after Justice League Dark will be Teen Titans: The Judas Contract and Batman and Harley Quinn. No release dates were given for either of these movies, and it wasn't announced who will write, direct or lend their voices to these projects. Take a look at the first trailer for Justice League Dark below.